Toys As Tools Educational Toy Reviews: Review & Giveaway: Trucky 3: He Said, "My Brain is Good"
Review & Giveaway: Trucky 3: He Said, "My Brain is Good"
If I were to get stuck on a desert island and a fairy prince came and told me I could have just one toy to keep me occupied, there would be no question - I would choose a logic puzzle. And my son, Number 1 would do the same or at least only Legos would tie with his favorite logic puzzles. All logic games are fun for me. Most of them are a series of puzzles that become more difficult as you progress. I can't get very far in any of them, but it doesn't matter. They are the toy world's rendition of my favorite equation in life: If this, then that. It's simple. There is no gray area. I know that I must remind myself and teach my kids that gray areas do exist but when it comes to play, there is nothing like a good logic puzzle that lets you feel like the world makes sense again. For us as a family, logic puzzles have a special place on our toy shelves. However, Number 2 Son seems not as suave with logic puzzles like Number 1 Son is. In our house, for the longest time, Number 2 was the jigsaw puzzle kid and Number 1 was the logic puzzle kid. But that has all changed now, thanks to Trucky 3. 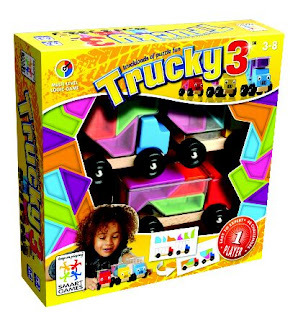 Trucky 3 (Not "Trucky the Third"- "3" because there are 3 trucks) is a game in which you are given a few partly symmetrical 3-dimensional shapes and are asked to make them fit in a transparent container of a truck. The containers are differently shaped and so are the shapes themselves. You must move them around and make them all fit and believe me, when you get 7 oddly-shaped 3D blocks and you have to fill up 2 containers with them, you can get lost. Yes, the age is 3+ but don't think a grown-up can't get stumped once in a while. Even though Number 2 is not a logic game lover, something told me that Trucky 3 could change things and it did! 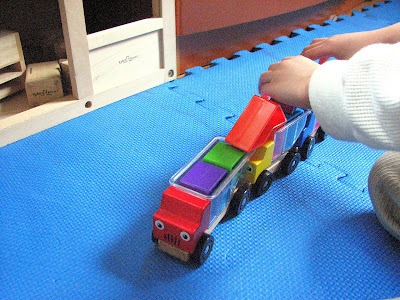 When he got the game, he loved it and started playing with the trucks immediately. Then, he started solving the problems and after solving a few, he started getting frustrated. I helped a little bit and then he was able to finish a tough one. He was elated. I melted. Wouldn't you? I am not sure if he has ever really told me that he thought he was smart. The reward is simple. 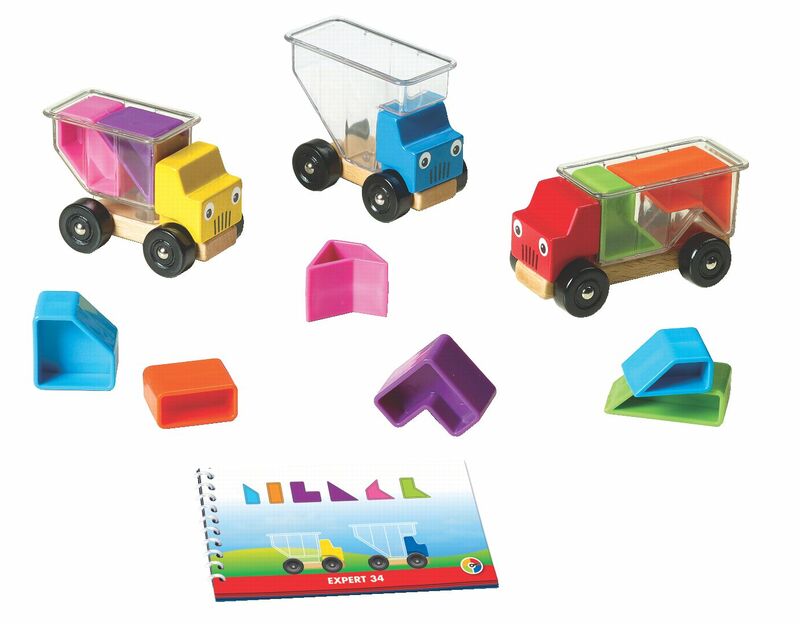 Your trucks are filled and you are ready to play! Smart Puzzle or Smart Toy? It's amazing that a logic puzzle can have so much influence over a young mind. At one point I wondered, if it was okay to allow for a situation where he challenged his mind so consciously. In fact upon solving a few puzzles and becoming hooked, Number 2 said something even wilder. He asked me to make sure his older brother, the logic puzzle prince, would not be allowed to touch his Trucky 3 until he was done solving all 48 puzzles. Whoa. I only see grown-ups with that kind of territorialism. 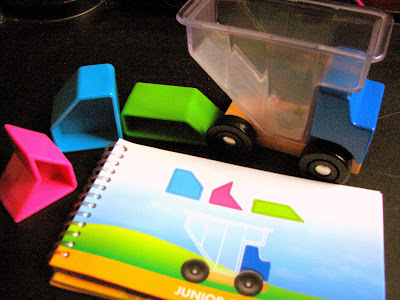 If I had ever worried even a little bit that this was too serious for my son, all I would have to do is take another look at these wonder trucks and I'd breathe a sigh of relief. At the end of the day, you can see the big difference between this and many of the logic games out there. That is, Trucky 3 is a toy too! Quite frankly, it's an excellent toy all on its own. The quality (heavy wood and thick transparent plastic) is great! Think about how many transparent container trucks your kids have! None, right? There are faces on the trucks too and they make a huge difference because if a child is ever feeling pressure to perform, the great part is that they need only to turn the trucks around and see those friendly faces. Number 2 calls them Mr. Yellow, Mr. Blue, and Mr. Red. 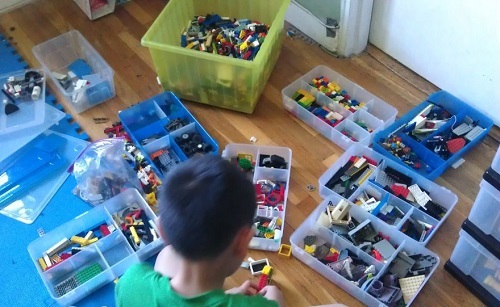 In fact, if you think about it, the kids can just sort of sit there and make things fit, as if you are building your own puzzle, just like the way you play around with Legos or mix paint colors. 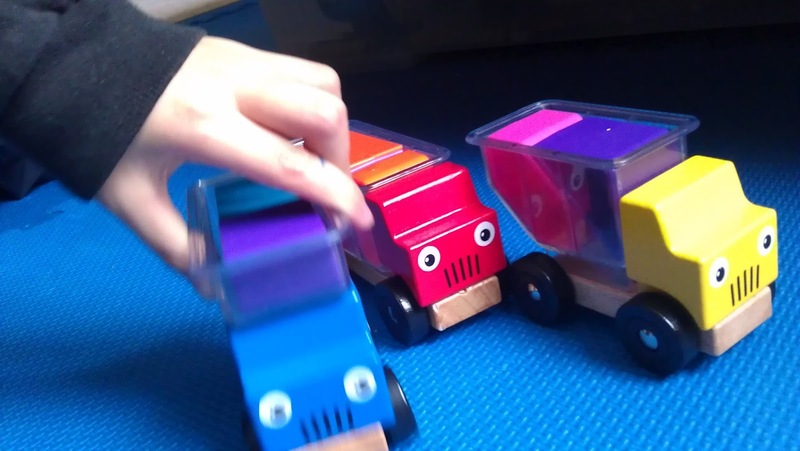 You can play around and create with them easily and naturally. Now THAT is the kind of smart I look for in a toy- A toy that practices more than one kind of smart. No one can help picking up these trucks. It will always meet adoring faces everywhere we take them. 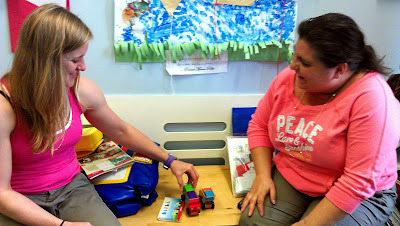 And so one day, while visiting Alison Berkley, a frequent expert consulted here at Toys are Tools, and her business partner, Amanda Friedman, both of them co-owners and expert educators at Emerge and See Education Center, I couldn't help but show off Trucky 3, my little one's pride and joy. Immediately, I got the Wows and Awwws from these two experts who have seen hundreds of toys and use them as tools everyday. He was having trouble and I tried to help but I could not! I tried to draw out logical reasoning scenarios and rule out bad combinations but I failed miserably. In the end, he didn't need me and he did it by himself. I asked these two great minds about the actual logical reasoning aspect of Trucky 3 because this seems more like a spatial awareness challenge to me. "Spatial awareness is really closely tied to logical thinking," Alison said, "It has to do with the different parts of the brain that are activated in both." She continued, "When you are doing logical thinking, you are actually helping the child say, 'Ok here's all the facts that I have, here are all the things that I know about the world right now, and here's where I want to get to.... how do I do that?'" Truthfully, we actually spent less time talking about logical reasoning and more time talking about everything else this toy could do, which is a lot! A Very Social One-Player Game? I don't think I've ever watched two educational professionals test out a game while I was present and that was a sight to see! Amanda started off and Alison swooped in, not to take over but rather to join in. Soon she said "Give me orange! Give me orange!" Amanda handed her an orange block and BAM! They were done and immediately slapped each other a high-five. In less than a few minutes, these two teachers showed me how Trucky 3 could POSSIBLY BE THE MOST SOCIAL one-player game ever made. What could be better than learning how to logically solve problems together? End result? Look at their faces above. If it takes two to complete, the victory can be twice as sweet! The fact that the trucks have faces makes it even more interactive on that basic person-to-person level. "You are bringing in social thinking," Amanda said. 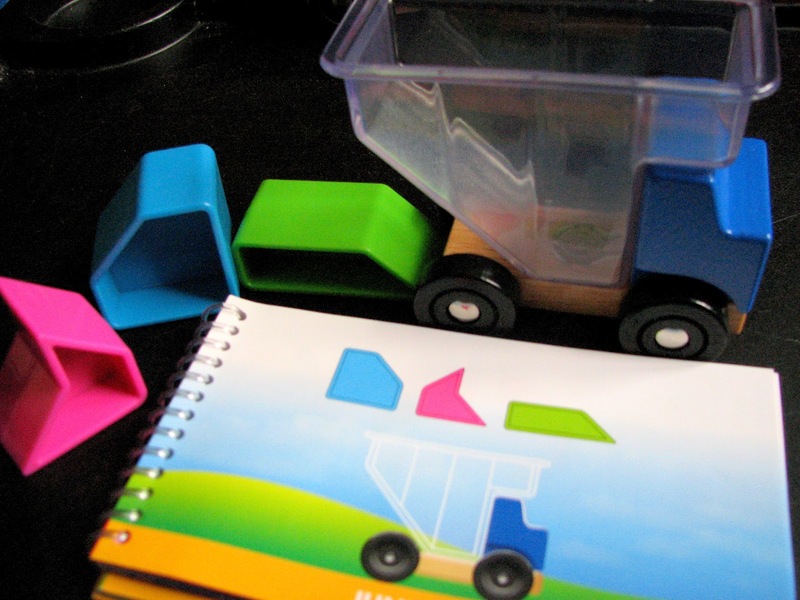 Trucky 3 - An All-Purpose Learning Tool? There are ways to use the answers to help a child with visual memory. Alison and Amanda suggested that you can flash-show them the answer and see if they can work off their memory. In fact, Number 2, tried this method a couple of times and it reaffirmed my assessment that he had a good memory because he has memorized the last two hardest levels (47 and 48)! But I credit his trudging through the other levels because he was able to learn how to solve it so his visual memory is partly logically based - excellent! Alison also added, "You need finger dexterity." This is true, I have seen Number 2 push blocks to the side to slide another one in which means you sort of have to manipulate gravitational pull. Trucky 3 blocks aren't supposed to be just stacked on top. 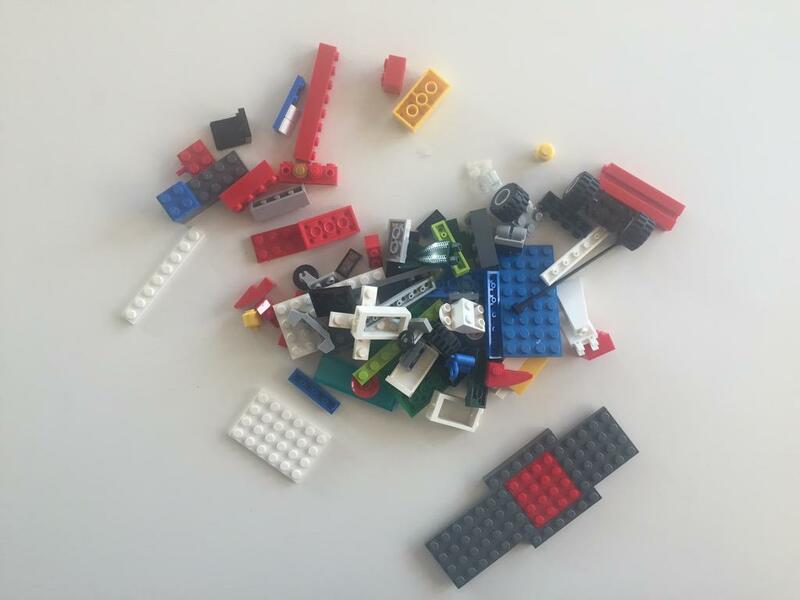 It's not super hard but a little tricky and I have seen my son put it back together in his hand first before placing it in the container. You can seriously get this for kids and just use it any way you like. Alison and Amanda told me how they could use this as something to help children with learning colors, "which truck has more? ", following simple directions, etc... There was so much to say on this level. Having the answers right in the back can be too tempting for some. For Number 2, it certainly was and he would often play right next to me because not only did I want to support him but I was his speed bump on the road to Impulsivity! However, to reduce frustration, I set a timer for him and told him to try his best before trying to take a look at the answer. This helped him a lot and he rarely ever needed to look at the answers! Phew! But having those answers right behind the puzzle question is actually great says both Amanda and Alison, "This type of thing is a foundation for when they are doing homework and they need to check their work. Well, in your textbook, where are the answers?" Amanda asked. A-ha! They are on the back page and who knows if you'll find it even if you can read the fine print of the index! Luckily Trucky 3 is different and this was Number 2's favorite part of the completion process: to turn the page immediately and receive positive affirmation. Tip 1: Take a peek! Alison and Amanda said that not only can you take a flash look but you can allow a child to take a peek at just one block, which is a hint that some puzzles provide anyway. I used dark colored post-it notes to act as a speed bump for full-peeking and showing tiny hints. "At a certain level, they need to learn where they are going so, it's like when you do a crossword and you do them all your own - and those last two things you can't get? You look at the answer for it," said Alison. 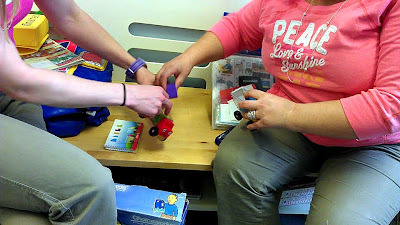 She also said that by doing this, it would help the child get to another puzzle and hopefully the next time, they'd get those last two on their own. Can you solve this with your mind's eye? Remember you must end with a flat top. Alison said that it is even okay to go to an "Expert" section and look at the answers and try that out. "They can look at an answer and still feel some sort of accomplishment and still feel the trajectory of where they are going to go." I understand this feeling. Kids want to know that it is solvable. I told these teachers that they were like ghosts in my home because without prior knowledge, they were able to describe the way Number 2 played this game and how he came to feel successful. Sure enough, as a prize for finishing the puzzle, he received another logic game for preschoolers and he was ecstatic! This was all good news because while you always want your kids to learn, you also want them to feel good during the process. That keeps the learning alive, in my opinion. I think that is exactly what has happened here. I can't recommend this game enough. I actually just bought it as a birthday gift for my son's classmate this month! Trucky 3 also won The National Parenting Center Seal of Approval this Spring. Number 1 Son also likes this game. Thank goodness he has finally been given permission by his little brother to play Trucky 3. An expression of devotion? 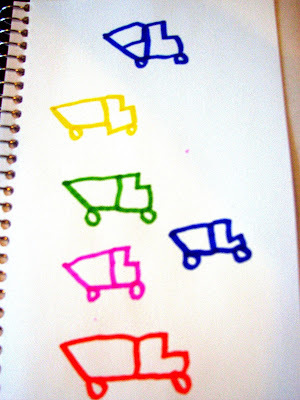 He has reams of paper like this with just trucks which he started doing while he was playing Trucky 3. I think he is just really proud of himself. This post is dedicated to my Number 1 Son, who used his flexibility skills to understand just how precious his little brother's self-esteem was. While this contradicted our family rules about sharing, he kept his promise and successfully restrained himself from playing Trucky 3 until he was given permission by his little brother. Disclosure statement: Toys are Tools has not been compensated in any fashion by the manufacturer or retailer of any of the mentioned products for the publication of this post. 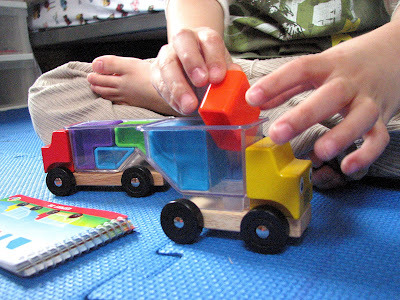 Trucky 3 was purchased by Toys are Tools. We would looove to win something like this! These look awesome. Both my 9 year old and 3 year would get a kick out these trucks. I wonder who would hide them in his room first? This would be so fun for boys!! This would be a great toy for the kids in my class. Your reviews are always so thorough - thanks! Excellent review. I love logic games and can't wait to get my hands on this one. Might have to go buy it, since it looks like a must have! This is one of the cutest toys I've seen in a long time. This looks awesome. And it works so many skills too! These trucks look amazing! thanks for the review. Looks cool. My daughter loves puzzles. I love thinking games! And these are just right for my 3 and 5 year old to play together. Thanks! A puzzle and a truck in one. 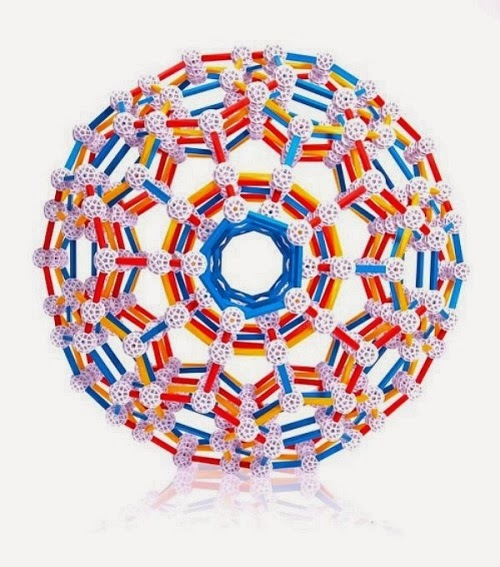 Would be a hit for my kids since both are near the top of their current favorite toys! Holy crow, would this be a hit in my house My youngest LOVES vehicles. My oldest lvoes thinking puzzles. My middle one enjoys anything with mulpitple pieces. Looks like a game to grow with! 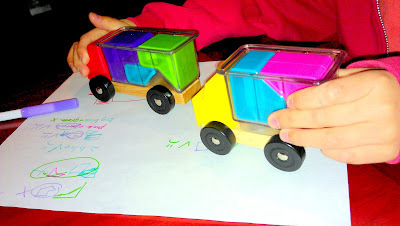 this looks like the coolest toy ever...my daughter loves vehicles and puzzles. Great combo!